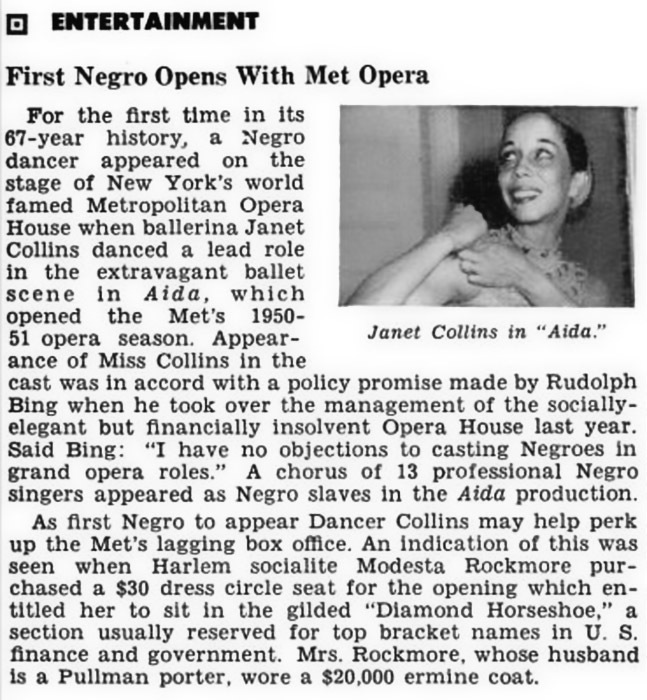 Janet Collins makes her Metropolitan Opera debut on November 13th, 1951 as the premier dancer in the opera Aida. The choreographer was Zachary Solov and Aida had 27 performances that season. She studied classical ballet as well as modern and ethnic dance, and her career reflected her versatility. At age 15 she auditioned for the Ballet Russe de Monte Carlo but declined an offer when told she would have to disguise the fact that she was black. She first performed as a theatrical dancer in 1940 and had her first solo recital in New York City in 1949. Collins appeared in the Cole Porter musical Out of This World (1950–51), receiving the Donaldson Award for best Broadway dancer. In 1952, a year after joining she became the first African American dancer to join the Metropolitan Opera Company.